The M Queens Boulevard/Sixth Avenue Local is a rapid transit service in the B Division of the New York City Subway. Its route emblem, or "bullet", is colored orange since it uses the IND Sixth Avenue Line in Manhattan. The M operates at all times. Weekday service operates between 71st Avenue in Forest Hills, Queens, and Metropolitan Avenue in Middle Village, Queens, via the IND Queens Boulevard Line and Sixth Avenue, the Williamsburg Bridge, and the BMT Jamaica and Myrtle Avenue lines. This makes the M the only service that travels through the same borough via two different, unconnected lines. The M short turns at Essex Street in the Lower East Side of Manhattan on weekends, and at Myrtle Avenue–Broadway in Brooklyn during nights. The M is the only non-shuttle service that has both of its full-run terminals in the same borough (Queens). Though the full route length between 71st Avenue and Metropolitan Avenue is about 18.2 miles (29.3 km), the stations are geographically located 2.47 miles (3.98 km) apart, marking this as the shortest geographic distance between termini for any New York City Subway service that is not a shuttle service. An MJ service ran the entire BMT Myrtle Avenue Line until 1969, when the section west of Broadway in Brooklyn was demolished. Before 2010, the full-length M ran from Middle Village to southern Brooklyn via the BMT Nassau Street Line and Montague Street Tunnel. The M had originally run on the BMT Brighton Line to Coney Island–Stillwell Avenue until 1987. Afterward, it used the BMT Fourth Avenue Line, and BMT West End Line in Brooklyn, terminating at Ninth Avenue or Bay Parkway. From July 2017 to April 2018, the full-length M terminated at Broadway Junction in Brooklyn, instead of Metropolitan Avenue due to construction on the Myrtle Avenue Line. Until 1914, the only service on the Myrtle Avenue Line east of Grand Avenue was a local service between Park Row (via the Brooklyn Bridge) and Middle Village (numbered 11 in 1924). The Myrtle Viaduct, a two-track ramp connecting the Myrtle Avenue Line with the BMT Broadway Elevated (now the Jamaica) Line at the Myrtle Avenue–Broadway station was opened on July 29, 1914, allowing for a second service, the daytime Myrtle Avenue–Chambers Street Line. These trains ran over the Williamsburg Bridge to Chambers Street station on the BMT Nassau Street Line in Lower Manhattan, and ran over the express tracks on the Broadway Elevated during weekday and Saturday rush hours. The number 10 was assigned to the service in 1924. Sunday service was removed in June 1933. All Saturday trains began running local on June 28, 1952, and on June 28, 1958, all Saturday and midday service was cut, leaving only weekday rush hour service, express in the peak direction (skipping stops between Marcy Avenue and Myrtle Avenue, as the J/Z does now). Marcy Avenue was originally a local stop, but beginning on February 23, 1960 all trains stopped there. M was assigned to the service in the early 1960s, with a single letter because it was an express service. Since the new cars using letter designations were not yet running on the Myrtle–Chambers service, it remained signed as 10; while the "M Nassau St" rollsigns were used for rush hour Nassau Street specials on the Brighton and Fourth Avenue Lines (RJ after 1967 for 4th Avenue rush hour service, later "RR"; Brighton/Nassau rush hour service was provided by the "QJ" which ran during weekday daytime hours). The line was officially designated "M" after the Chrystie Street changeover on November 27, 1967, but did not appear on the trains until the transition to rolling stock equipped with appropriate roll signs. 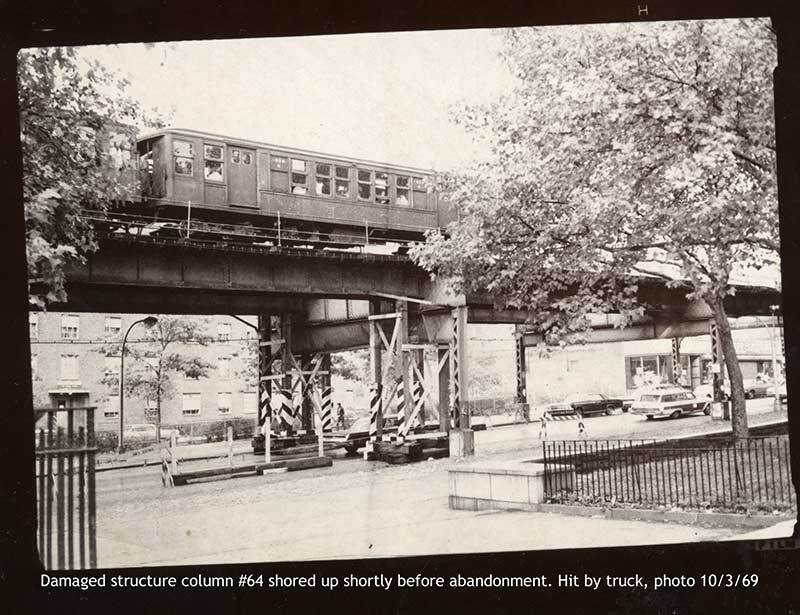 The second half of the Chrystie Street Connection opened on July 1, 1968, and the JJ, which had run along Nassau Street to Broad Street, was relocated through the new connection to the IND Sixth Avenue Line (and renamed the KK). To augment QJ service to Broad Street, the M was extended two stations, from Chambers Street to Broad Street. Beginning Monday, October 6, 1969, to make up for the discontinuation of the MJ due to the closing of the Myrtle Avenue El south of Myrtle Avenue to Jay Street, the M was expanded to run middays and a new SS shuttle ran between Myrtle Avenue-Broadway and Metropolitan Avenue at other times. Effective January 2, 1973, the daytime QJ was truncated to Broad Street as the J, and the M was extended beyond Broad Street during the day along the QJ's former route to Coney Island–Stillwell Avenue, via the Montague Street Tunnel and Brighton Line local tracks. By this time, the off-hour SS shuttle had been renamed as part of the M. The local K (renamed from KK in 1973) was eliminated on August 27, 1976, and the M express service between Myrtle Avenue and Marcy Avenue ended in order to provide adequate service in Williamsburg, Brooklyn. Reconstruction of the Brighton Line began on April 26, 1986, and the weekday daytime M was shifted to the Fourth Avenue Line's express tracks south of DeKalb Avenue and the BMT West End Line terminating at Ninth Avenue during middays, with an extension to Bay Parkway during rush hours. This service duplicated a pattern that had last been operated as the TT until late 1967. M service along Fourth Avenue was switched to the local tracks on May 31, 1994, switching with the N, which had run local since the M was moved in 1987. The midday M was temporarily truncated to Chambers Street on April 30, 1995 from Ninth Avenue in Brooklyn due to the closure of the Manhattan Bridge during weekday middays for structural repairs. The change was made permanent on November 12, 1995, after the six-month repair project was completed. Brown M diamond bullet 2001-10. From April 1997 to August 1997, during late nights and weekends, the M terminated at Essex Street due to reconstruction of Myrtle Avenue. From May 1 to September 1, 1999, the Williamsburg Bridge subway tracks were closed for reconstruction, splitting M service in two sections. One service ran at all times between Middle Village–Metropolitan Avenue and Marcy Avenue. The other ran rush hours only between Bay Parkway and Chambers Street. A shuttle provided service on the BMT Nassau Street Line. Fares on the B39 bus crossing the Williamsburg Bridge were eliminated and free subway-bus transfers were given at Marcy Avenue and at Delancey Street. The closure was anticipated to last until October 1999, but subway service was restored one month ahead of schedule. The project cost $130 million, including replacing the tracks' support structure, signal systems and other equipment. From July 23, 2001 to February 22, 2004, work on the Manhattan Bridge subway tracks resulted in a midday extension back to Ninth Avenue, as well as an extension of the times that the rush hour service was provided to 10 PM. This change preserved service between the West End Line and Chinatown for passengers that would have taken the B to Grand Street. When full Manhattan Bridge service was restored, midday M service was cut back to Chambers Street. The September 11, 2001 attacks caused a temporary reduction of the M to a full-time shuttle until September 17. Then it was extended full-time over the BMT Sea Beach Line to Stillwell Avenue, replacing the N, until October 28. In December 2007, the MTA announced that it planned to set aside $27 million in 2008 and $60 million annually afterwards for service enhancements to help riders deal with increased fares. Extended weekday evening M service to Broad Street and weekend service to Chambers Street were part of the plan. However, on March 24, 2008, it was announced that because the agency received substantially less revenue from taxes on real estate transactions, the enhancements were reduced to $4.5 million in 2008 and $8.9 million annually afterwards. The plan to extend weekend service to Chambers Street was dropped. After several months' delay, weekday evening trains were extended to Broad Street on July 27, 2008. 1979-2010 bullet, when the M served the BMT Nassau Street Line in Lower Manhattan, and 2017-2018 bullet for the shuttle service, as orange M's are not present on older rolling stock. In late 2008, in light of severe budget woes, the MTA announced a slew of potential service cuts; among them was the potential elimination of rush-hour M service which had extended beyond Chambers Street on the Nassau Street Line in Lower Manhattan to Bay Parkway on the West End Line in Brooklyn. This, as well as all other proposals, were no longer considered after Albany lawmakers offered financial support to the MTA in May 2009. However, in late 2009, the MTA once again discovered that it was confronting another financial crisis; most of the same service cuts threatened just months earlier were revisited. One proposal included completely phasing out M service and using the V as its replacement. Under this proposal, the V would no longer serve its southern terminus at Second Avenue. Instead, after leaving Broadway–Lafayette Street, it would run along the Chrystie Street Connection, unused since the elimination of the K in 1976, and stop at the upper (BMT) level of Essex Street in Manhattan before serving all M stations to Metropolitan Avenue in Queens. The MTA determined that this move, while still a service cut, would actually benefit M riders in northern Brooklyn; approximately 17,000 weekday riders use that route to reach its stations in Lower Manhattan, whereas 22,000 transfer to other routes to reach destinations in Midtown Manhattan. However, only about 10,000 riders in Southern Brooklyn use the M to access the Nassau Street Line. This merger opened up new travel options for northern Brooklyn and Queens in that it allowed direct and more convenient access to areas that were not previously served by those routes such as Midtown Manhattan (before the service changes, M train passengers had to transfer at least once if heading to Midtown, either at Myrtle–Wyckoff Avenues, Essex Street, Canal Street, Chambers Street, or Fulton Street). On March 19, 2010, it was reported that the plan had been changed and that while the new combined route would still be used, it would carry the M train designation, recolored orange to designate the IND Sixth Avenue Line as its Manhattan trunk line, while discontinuing the V train. Many MTA board members opposed the elimination of the M designation, saying that riders would be more comfortable with that rather than a V designation, and because the M had been around longer than the V. Official M service via the Chrystie Street Connection began on Monday, June 28, 2010. Starting June 8, 2014, daytime weekend M service was extended to Essex Street as part of an $18 million funding project to improve subway service; late night service continues to terminate at Myrtle Avenue. As of 2016[update] the M is at 90% of New York City Transit's loading guidelines during the AM rush hour. Ridership on the M has been growing very rapidly since the 2010 service change, and this trend is expected to continue. In June 2016, peak train frequencies on the M route were increased, and it is expected that peak train frequencies would be raised again in the future. From July 1, 2017 to April 30, 2018, reconstruction of two sections of the BMT Myrtle Avenue Line—the approaches to the line's junction with the BMT Jamaica Line and Fresh Pond Bridge over the Long Island Rail Road's Montauk Branch in Queens—required a reroute of M service. Trains to and from Manhattan and Queens, instead of going to Metropolitan Avenue, ran via the BMT Jamaica Line between Myrtle Avenue–Broadway and Broadway Junction at all times except late nights, when service was suspended. A limited amount of rush hour trains ran between 71st Avenue in Queens and Second Avenue in Manhattan, replicating the V train's routing prior to its discontinuation in 2010. Three shuttle bus routes ran during reconstruction of the Fresh Pond Bridge: one between Myrtle Avenue–Broadway and Fresh Pond Road; the second between Myrtle–Broadway and Metropolitan Avenues, skipping the Fresh Pond Road station during the daytime hours; and the third between Flushing Avenue/Broadway and Middle Village–Metropolitan Avenue, stopping at Flushing and Wyckoff Avenues for a transfer to the BMT Canarsie Line at Jefferson Street. When the Fresh Pond Bridge project was completed on September 2, two six-car shuttle trains began operating between Metropolitan and Wyckoff Avenues at all times, running separately from each other on each of the two tracks; two additional six-car trains were stored in the Fresh Pond Yard in order to swap consists in and out of service. These shuttles, along with a shuttle bus route that provided service between Wyckoff Avenue and Broadway, ran until April 27, 2018. When the 14th Street Tunnel shutdown starts in April 2019, weekend and evening M service is planned to be extended to 96th Street on the Second Avenue Subway line in Manhattan to compensate for limited L service between Brooklyn and Manhattan. The M would have to run to 96th Street because of capacity reductions on the Queens Boulevard Line due to ongoing weekend construction. Both weekday and weekend M frequencies would also be increased. On March 5, 1944, 11 trains stopped running over the Brooklyn Bridge, instead ending at Bridge–Jay Streets on the Brooklyn side, and all 11 trains terminated there (with a free transfer to the IND trains at Jay Street–Borough Hall). In 1967, when the Chrystie Street Connection opened, the label MJ was assigned to the 11 service. MJ was only marked on maps and station signs; the cars along that route never had route signs. The western half of the Myrtle Avenue Line closed on October 4, 1969, ending MJ service, which was replaced with a free transfer to the B54 bus. Several days before the scheduled closing date, some supports for the elevated structure was hit by a truck, temporarily suspending service. Timber reinforcement was applied to damaged members, allowing service to resume operation until the scheduled closing date. ^ a b "M Subway Timetable, Effective June 24, 2018" (PDF). Metropolitan Transportation Authority. Retrieved June 24, 2018. ^ "Distance between the Middle Village – Metropolitan Avenue and Forest Hills – 71st Avenue stations: The shortest between two terminals on any route other than shuttles on the New York City Subway". Flickr. Retrieved September 2, 2016. ^ "New L Loop in Use: Long-Sought Improvement Inaugurated Today". Brooklyn Daily Eagle. July 29, 1914. p. 1. Retrieved January 24, 2016. ^ a b c d e f "NYCT Line by Line History". erictb.info. ^ "SKIP-STOP SUBWAY BEGINS RUN TODAY; KK Line Links 3 Boroughs --Other Routes Changed" (PDF). ^ "TRANSIT AGENCY DROPS 215 RUNS; Resulting Schedule Shifts Bewilder Passengers" (PDF). Retrieved October 23, 2016. ^ "No trains over Williamsburg Bridge". ^ "NYC DOT - Williamsburg Bridge". www.nyc.gov. Retrieved June 6, 2016. ^ Donohue, Pete (September 2, 1999). "IT'S J - AS IN JOY - TRAIN RIDERS FLYING HIGH ON FIXED-UP W'BURG SPAN". New York Daily News. Retrieved June 6, 2016. ^ "265-03 M Train M&S" (PDF). Archived from the original (PDF) on June 7, 2003. Retrieved June 6, 2014. ^ "MTA 2008 Adopted Budget February Financial Plan 2008-2011 Appendix" (PDF). mta.info. Metropolitan Transportation Authority. February 2018. p. 11. Retrieved October 15, 2018. ^ Neuman, William (June 19, 2008). "Subway Service Increase to Be Less Than Hoped". The New York Times. Retrieved October 15, 2018. ^ Neuman, William (March 24, 2008). "M.T.A. Postpones Subway and Bus Service Upgrades". The New York Times. Retrieved October 15, 2018. ^ "Wayback Machine" (PDF). December 21, 2008. ^ "Service Adjustments on BMW Lines". www.mta.info. Metropolitan Transportation Authority. July 24, 2008. Retrieved October 15, 2018. ^ "2010 NYC Transit Service Reductions". MTA New York City Transit. January 27, 2010. Archived from the original on March 13, 2014. ^ "2014 - 2017 MTA Financial Plan". Archived from the original on July 25, 2013. ^ "Planned Service Changes: Weekends beginning Sunday, June 8, 2014". Archived from the original on June 12, 2014. Retrieved June 7, 2014. ^ Kelley, Ryan (April 25, 2018). "M Train on track to return to full service on Myrtle Ave in Ridgewood next week". QNS.com. Retrieved April 27, 2018. ^ a b Rivoli, Dan (March 17, 2016). "M line to be shut down next year for repairs". New York Daily News. Retrieved July 23, 2016. ^ a b Brown, Nicole (March 18, 2016). "MTA: M line will shut down for part of next year". am New York. Retrieved July 23, 2016. ^ a b "Myrtle Avenue Line Infrastructure Projects". mta.info. Metropolitan Transportation Authority. Retrieved July 23, 2016. ^ Korman, Joe (December 16, 2017). "BMT-IND Car Assignments". JoeKorNer. ^ New York City Department of Transportation; Metropolitan Transportation Authority (July 2018). "Fixing the L Line's Canarsie Tunnel" (PDF). mta.info. p. 18. Retrieved July 27, 2018. ^ a b "Transit & Bus Committee Meeting October 2018" (PDF). mta.info. Metropolitan Transportation Authority. October 22, 2018. p. 195. Retrieved October 22, 2018. ^ "Brooklyn Bridge Train Service Ends Today--Trolley Cars Stay On". Brooklyn Daily Eagle. March 5, 1944. p. 11. Retrieved January 24, 2016. ^ "Service Changes for Myrtle Avenue "El" Riders". joekorner.com. New York City Transit Authority. October 1954. Retrieved January 24, 2016. ^ "Damages structural column #64 shored up shortly before abandonment. Hit by truck, Photo on 10/3/69". Wikimedia Commons has media related to M (New York City Subway service). "M Subway Timetable, Effective June 24, 2018" (PDF). Metropolitan Transportation Authority. Retrieved June 24, 2018.